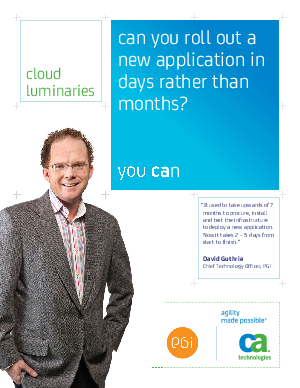 > CA Technologies > Can you deploy a new application in days rather than months? Cloud Luminaries are cloud service providers who are showing enterprises and SMBs the way to realize value from cloud computing, and showing other MSPs how they can build margin by offering a range of cloud-based services. In this executive Q&A, Cloud Luminary and PGi CTO David Guthrie discusses how the cloud computing platform helped his company scale up immediately by getting his applications running efficiently in a matter of days, rather than months.